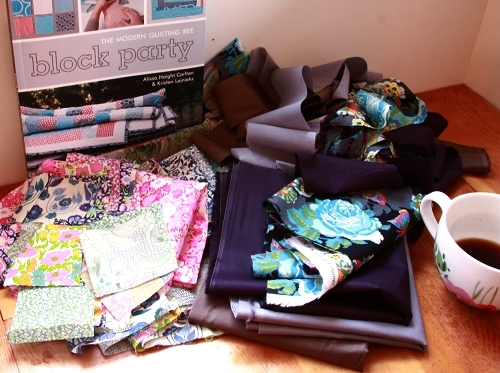 I was fortunate enough to meet the lovely Alissa Haight Carlton at Quilt Market only weeks ago, and the feeling you get from her is just the feeling that I get from her new book, Block Party, which was written together with Kristen Lejnieks. And that feeling is one of approachability and warmth. After talking to her for a only a bit, I wanted to sit next to her and sew. The book, after reading a few pages, makes you feel just the same way. You just feel invited. Not in the fancy invitation that comes in the mail and requires a new dress kind of invitation, but a hey, come over here and join us kind of invitation. The best kind. The book covers 12 women who formed a modern quilting bee so that each would contribute a block to one person's quilt concept each month. All the blocks would be sent to that one person, and she would get to assemble the quilt and keep it. By the end of the year all twelve of them had done the same, each keeping a piece of history and the work of 12 minds, 24 hands. I love thinking of how every block in every quilt was created during a completely separate set of circumstances within each quilter's life. And that they each, doubtlessly, struggled more with one block than another, experienced successes and emotions that they wouldn't have otherwise had. Some days I imagine that making the block was the most peaceful part of their day- I'm sure other days, they forgot to get to it all together, and stressed a bit to finish it. Each one different. Each one a record of time. Each one perfecting a skill they already possessed or pushing them into a new one. And all together the quilt then, an expression of many. I do believe that is the heart and soul of quilting. I took note of my dear friend Denyse's introduction to the book, most specifically where she writes that "the best way to learn something (to understand it viscerally and not just intellectually) is to make it happen with your own hands." That, in addition to all the wonderful inspiration, and perfectly clear instructions is what had me chopping up my Liberty stack faster than you can say bee (which doesn't take long at all). I was so inspired by the Confetti quilt because it felt most different from what I typically do. More improvisational. I see a lot of quilts. Lots and lots. And the moment I see them I either get it and move on, or I get it and I want to try it. Or better still, I get it, want to try, and even meditate for a while on how I might interpret it to see it anew. So here I am, improvising within the boundaries of this lovely Confetti block. Instead of using all white for the solid background, I decided to show off all the irregular strip widths by using 3 solids from my voiles (sixpence, midnight, river rock). And because I can't leave well enough alone, in addition to the 3 background solids, I decided to interject one of my own prints. The good for me thing, in addition to it being a scrap + solid style block, is that its perfect for special fabrics that you'd like to use a bit sparingly. So after only messing around for about an hour or so this morning, I am finding myself entirely charmed with this process, remembering how much I love to wing it, and loving how this one little block is a microcosm of the quilt it will become. And even each component of the block, its own abstract composition- beautiful and unique. I've decided that I need a little tiny bit of this freedom on a regular basis, so I think I'll do one every Saturday morning. We'll see how that goes. I'm glad to have the company of these talented women every time I open this book. count me in! i'd love to win a copy of this book. Oh, I'd love to get my hands on this book! Thanks for the giveaway! Isn't it amazing how we each can look at something and then create it in our very own unique style! Love your take on the this quilt. I love it! Its so wierd to see you inspired by someone else, when you're the one that does so much inspiring on a daily basis! Thanks for letting us know about Block Party! I would love to win this book, it looks amazing! I want to try my hand at more improv piecing, and I love the blocks you made! It would be great to win this book! Thanks for the chance! Oh, I would LOVE this! Your fabrics are so beautiful! Love it! I'm new to quilting and can't decide which pattern to try next. This book might just be the inspiration I need! This book would be great to add to my library- thanks for the giveaway! 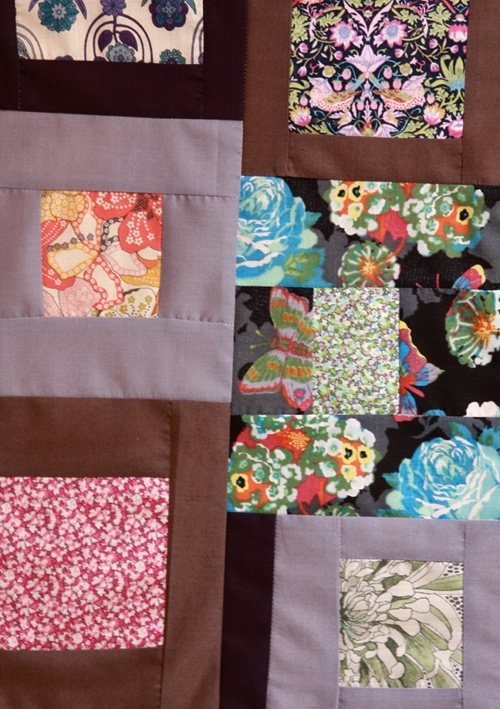 Liberty fabric is gorgeous to sew with, your block looks lovely. I would love to try one of these quilts! This looks like a wonderful book to add to your craft library. Thanks for the opportunity to win. Oh, I do believe I would very much enjoy owning my very own copy of this book. Such great inspiration! Thanks very much for the give away. I've been drooling over this book. I love the idea of a quilting bee and doing a square a month for other crafters. The book sounds wonderful! I want to join a block party!!! Thanks for the chance to win a copy of this book - looks like a good one! Beautiful post! I love your thoughts on quilting and community. And I am so excited to check out this book, (whether I win it or buy it)! I'd love to win a copy too! As does the modern quilting bee... wish I knew more women who sewed to create something like this, though in modern times I suppose it could be done from a distance. 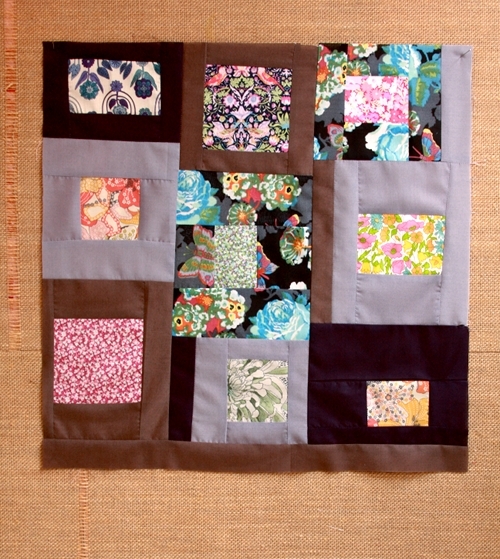 Also, I can't wait to see your finished quilt - love the brights against the muted tones. That confetti block is fun in white and earth tones. Lovely! Like your block! Would love the book too, me thinks. I was just thinking today that I needed to start a new quilt - the book looks lovely! Beautiful, I love how you can take a pattern and truly make it your own by changing the colours or using a print in an unexpected place. Thanks for the generous giveaway! Your block looks great. I spent Monday cutting into my Loulouthi stash and most of last night sewing it up. I hope to finish the quilt top tonight but I haven't had enough quality time with the fabric yet. I'm going to have to come up with another quilt to make from it. yeah! I would love to win a copy. I am in my first on line bee (which is improv!). This book would be the perfect inspiration. oh i would love this book. Thanks for the chance and have a great summer! I'd love a copy, thanks for the chance! I like the way you interpreted the block. I'd love to have a chance, too! Thank you for sharing your insights and opportunity to win a copy! I'd love to win this book. I've discovered some wonderful blogs from this blog tour. This book looks great! Thanks for the chance to win. Boy, would I EVER love this book! Love your block, too! Every time I see the quilts from this book, I want the book even more. Thanks for the chance to win. yes please! i would love a chance to win a copy of that book, it looks like fun! I am lovin the butterflies fabric....and would love love that book. Thanks for having a giveaway! Improvisational quilting is something I have recently had the joy of trying too- wow, what liberating fun! I can't believe how much stress is taken away from quilting when you purposefully don't try matching seems or making things perfect- I have realized that I love both traditional and modern quilting and will make room for both in my little world as long as I am having fun. I sure would love to win this book! This book looks great. I'd sure love a chance to win! If you recommend it, then I'm sure I would love it! This book looks great! Thank you! Sounds so interesting! I would love a chance to win this book. That sounds like such a wonderful book. I love it when there is a story behind something and it's not just instructions. I'll keep my fingers crossed. Thank you for the chance to win such an amazing book! I would love to try the confetti block, along with the other techniques in the book. I'm fairly new to quilting and I'd like to move out of my comfort zone of straight lines all the time. Making a quilt outside the box is a bit out of my comfort zone but I do love looking at different ideas. I really enjoyed looking at Gwen Marston's Liberated Quilting book and this looks along the same lines. It sounds like a fun book and I would love a chance to win the book. I would love to sit down with this book AND have someone wave me over to join a sewing group! I'd love to sit down and browse through this book! 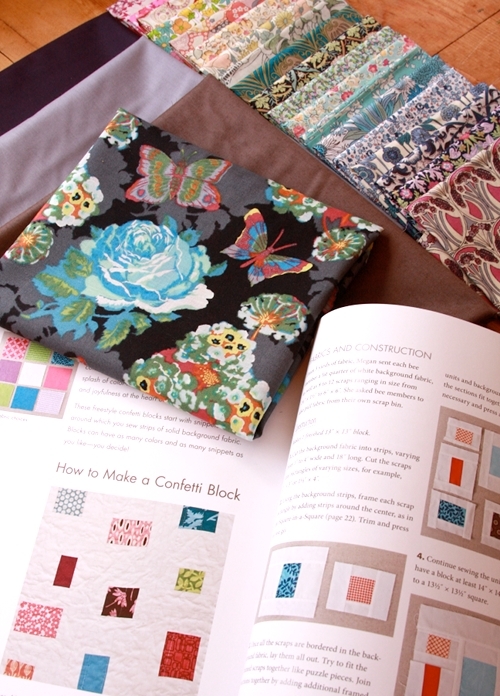 As a garment sewer I've often declared "I don't quilt" but have found myself drawn to these fabulous quilt designs and books. Wow I feel inspired just from reading your post about the book, so yes please I'd love to win a copy! Thanks so much. Hadn't heard about this book until now! I love a new quilting book. Usually carry it around with me for a few weeks so I can flip through the pages whenever the opportunity presents itself. Thank you! Yes please! I would very much love to win a copy of this book!! yes please, it sounds like a lovely and useful book! This sounds like such a LOVELY book. I'd love to win it! Oh I love this idea with Liberty prints and I really want a copy of this book! Thanks for the giveaway - would love to win this book!! i have to say.... i have been fairly desperate to get my hands on a copy of this book!!! love love love true love! I loved your insight on the book and your piecing process - thank you! Also, thanks for the giveaway - I'd love to win! I like your spin on the confetti block, which is one of my favorites in the book. Thanks so much for the opportunity! I would love to win a copy of this book! Oh, I would love to have this book! Looks like a great one. Oh how I would love to win a copy of this book! I'm in for a copy, my local bookstore doesn't have it yet, so I'm banking on winning! Winging it is relaxing and really a way to get the creativity rolling. Love what you did, and definitely in on the book! That Confetti quilt is my favorite and I would love to win a copy! After many years of sewing clothes, and disdaining quilts, I have all of a sudden become obsessed with them. I read about this book last week and was going to go out and buy myself a copy. Will hold off in case I am the lucky winner. But will certainly buy it if I do not. love the florals!! a copy for me?? I want one! I want one! Beautiful quilt blocks. Thanks for sharing. wow, wow, wow, now this sounds like a quilt book not only can I sink my teeth in...but use my hands to get what's in my head OUT! Lusting over this book! I even went to a local bookstore to see if I could find it but it musta been sold out :) I'm making a quilt for my cousin as a wedding gift so I'd love the inspiration! Thanks for the review - looks like a great book! Great book, I will be keeping my fingers crossed! It is a great book, got to flip through one at a quilt shop a few weeks back, but sadly went home without it... Maybe I can win one!?! This looks like a wonderful book. I hope I win a copy. Ooohh....I would love to win a copy of that book. Thanks for sharing! This is by far one of the best reviews I've read of any book, really. Thanks for sharing! I love the hexagon quilt in this book!! Thanks for the give away! I'm always stuck with what to say when you can leave anything in a comment! I'll just say I have been following this book blog tour with no luck so far so shall continue and see if I will be a winner! Yes please! And oooooh those Liberty prints. I would love some inspiration to get me off my well beaten path!! Sounds like a great book with a fantastic premise. Woot! I would just *love* to win this book! Great review - I love the books that make you just jump right in! Wow! Sounds like a truly inspiring book and makes me want to learn to quilt so would love this book! Thanks for the chance to win it! I'd love to win the book! What a lovely write-up. I would love to win this book. Fan4may at aol dot com. That looks like such a fun way to make a quilt top! I would love this book! Thank you for the lovely meditative post this morning. It was nice to pause and remember something I love about quilting. I would love, love, love a copy of this book. Love your block! Thanks for the review and chance to win. This sounds like a spectacular book! I'm a new quilter.. only one almost done, but tons in my brain. You, Anna Maria were the first to inspire me to try my hand at the craft and now I'm in love with the whole shebang! Thank you for letting us into your minds eye when we read this blog, you truly are a special woman. Oooh!! I want one, please! Would love to see all the intricacies of these blocks! Thanks for the giveaway! Would love to start some projects from that book! You and Denyse are so rigth - the best part is about doing something with your own hands and then having it as a reminder of a certain period of your life. So beautiful! Thanks for the chance to share in the fun! Would love my own copy! The book sounds wonderful and it's so good to see your project taken from it! I'd love to win a copy and be inspired to make my own blocks - thanks for the opportunity! oohh ooo! pick me ;-) it is always a delight to see what you have been making! This book looks so wonderful! It would be fun to read about these talented women! One of my favorite quotes is by Geri Weitzman: sometimes you gotta creat what you want to be a part of. I love your idea of using different colors instead of one solid background. And what a great way to use up some scraps! I can't wait to get this book! Be it winning it or purchasing it, it looks fabulous! Man, count me in for the book! If anything, I'm learning of a bunch of new blogs to learn from. This post totally makes me want to buy that book! If I don't win one I will seriously consider dipping into my "fun money" to get it! This book looks so inspiring. I love your take on the confetti block. Your stack of liberty fabrics makes me want some even more, they are so beautiful and work beautifully with yours. Many of my books are borrowed from the library, but this book is definitely one I want to own - pouring over the pages and trying new techniques. I'd love to win a copy! Love your interrpretation--and I would love to have this book! I love what you have done so far! Very inspiring! I get it and want to get started with some of your yummy fabrics! Thanks for introducing us to this delightful book. Maybe I will be the lucky winner! This looks like a pretty fabulous book. I desperately need some inspiration. But my real reason for commenting is to find out what that wonderful fabric with the big blue roses and butterflies is. I would love to own this book! I am also determined to find twelve sewing friends with whom to recreate this experience - how wonderful! Really different take on the confetti block. Love how a simple swap of fabric can totally transform a block. I would love to win this book! Pick me! I've been following the Blog. I am loving the book! What a unique process and concept. I can imagine being part of such a lovely group project. Thank you for the exposure to this book and project, for sharing your experience and project, and for the giveaway opportunity. I love seeing how you put your own spin on one of the patterns from the book! Really wanting to get back to quilting. This book looks inspirational! Sounds like a great book! Count me in! I hope to get quilting after I finish my wardrobe capsule for our Greece trip. Enjoyed reading about your experience with the book. Thanks for the giveaway. Yes please! (Love the idea of a quilt that you can use "special fabrics sparingly" with - I have a lot of those fabrics that I am reluctant to cut into.) Thanks! I'd love to win a copy of this book! If I won it and you stuck a scrap of Liberty in between the pages I'd be over the moon! Oh, how I'd love to win! I had the pleasure of meeting Alissa (and Denyse) a couple of weeks ago, and I know what you mean about her being inviting. Can't wait to see the book! I would love to have a copy. The book looks so wonderful. Oh, I would love to win, but may have to have it either way!! I am so inspired by your posts! Thank you for this giveaway! Oooh... looks like a fantastic book! Love the colours you have used in your quilt. so enjoyed reading your review and your river rock voile is just the most wonderful colour. i have a little which i am mixing in with some boyish liberty lawn to make a quilt for my little boy. I just made an orange and gray confetti block for a quilt that members of my MQG are making. So fun! What a great post - so well written! Giving ourselves freedom once in a while is crucial. Whether time constraints, design constraints or simple left-brain constraints, we usually forget to let go and let "It" happen. I'm so happy you got time to play like this. Read your interview with sew4home and really enjoyed it. This is one book that would like to win and use to make some quilts - a mini block party with my mother to make the one that looks like a log cabin. Please enter me into the drawing. Thanks for the stop on the blog tour. I am aching to begin quilting - this looks like the perfect introduction with no hard and fast rules! this makes me wish i had 11 other women (or men) around me who love to quilt. I would love a copy of this book. Maybe it will inspire me to teach others the basics of this art I love. Thanks for sharing! Oh keeping my fingers and toes crossed to win this lovely book. What a fun looking book! I really need it! this book looks so inspiring. i love the background story of the 12 women and 12 quilts! thanks for sharing. This book sounds really intriguing! I love the idea of sharing blocks with friends. I'd love to have a copy ! Thanks for the giveaway. i'd love to win a book! i've only made 2 quilts but i'm eager to make more! oh yes, this would be a great book to have. oh my goodness, i'd love a chance to win this fabulous book! I could not agree more with the sentiment that doing is learning... Or vice versa. Though I so rarely give myself the permission to play, and possibly, fail. This book is on my list. I'd love to have a copy and maybe assemble my own bee. Crazy, crazy, crazy!!!! I'm in a frame of mind where I need some inspiration...I would love the book! Thanks for the chance to win, the confetti block/quilt is my fav. I am loving this book!! Thanks for the chance to win it! I think this book would give me the motivation I need to try improvisational piecing! Thanks for sharing! This book looks beautiful and inspirational. Would love love love my very own one to hold and to peruse at leisure. Thanks for this golden chance. I would love this book! Thanks for the opportunity. The less time I have, the more great projects I see and want to try... sigh. Thanks for the generous giveaway! Please, Please, Please, please pick me!!! The book looks amazing!! I love the colors you chose for your blocks. What a wonderful idea, I want to start my own bee! Thanks for the chance! A while back, a bunch of us from a quilt guild took a color and design for quilting class from a local instructor. We decided to reward her with a quilt of "crazy" pieced apple blocks, a block made by each of us. The effect was gorgeous with red, green and yellow apples and she was so thrilled! O-o-o-o....I was just needing this sort of inspiration. Thanks for sharing!! I have this book on my wish list but the bills have to come first.... I go to the bookstore occasionally and fondle it, but always put it back. It's a luxury. BTW I can't get enough of the Summer Totem Tart fabric. It's really beautiful and my friend gave me a yard of it as a happy day present! You put so much love into all you do, no wonder you are successful!! I would love this book so I can jump into a little improv!! Hey, way to improvise! Yes, Yes, Yes, I really want a copy of this book! (please) It's tough to bust out of accurate piecing, points that don't disappear and seams that match, but I'm willing to through caution to the wind and try. Would love to win this book for my wonderful sister Debra!! She is a big time fan of all of your fabrics, just like me! She is my inspiration and motivator! Even though we do not live near each other we sometimes work on the same quilt patterns!